I am converting a guitar into a mandocello, Not everything is done but I think it sounds fine and am looking to make it better. 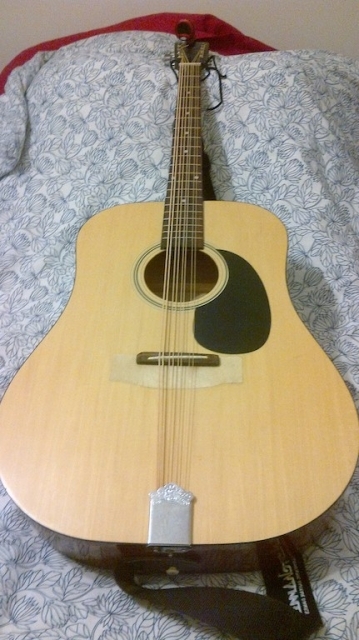 Here is my guitar to mandocello conversion. Just a few sounds as I have finally received the strings. It is supposed to tune C G D A in the same range as a Cello. It sounds nice. > a work in progress > SWEET! > the sounds you are getting are SWEET!!! Thanks Stonedog.... happy so far, have a busy non musical weekend but eager to get to refinements. RAY!! wow.. that is a great sounds. Thanks for sharing your first sounds and for keeping us posted in chat on the development. Very cool to have this creation! Thanks for the kind comments. Took the nearly finished mandocello for show and tell at the music store I have been getting mando parts from and they seemed very impressed. The Guitar mechanic suggested I needed to have the truss rod adjusted to make setting the action easier. He proceeded to do this with a rather long allankey with big screwdriver handle and later switched to an l shaped one with 8" arms on the L and was able to really crank the truss rod and take all of the bow out of the neck. He then called the owner over, a nice gentleman just a bit older than I, who declared my effort fantastic.